When it comes time to service your vehicle, visit our website. 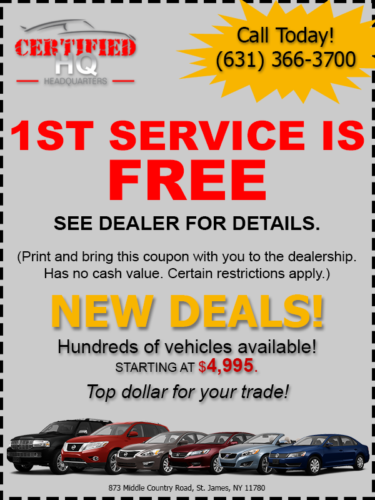 On our website, you can print your first free service coupon and bring it to our dealership. When you provide us with this coupon, our expert mechanics will service your vehicle at absolutely no cost to you! At Certified Headquarters, we know the value of a good used car. We know exactly how to get you behind the wheel of a car for an affordable price, without compromising on quality. We also accept trade-ins, so you can get a newer vehicle for a discounted price. Enjoy the outstanding customer service that our knowledgeable sales staff has to offer to you. Once you’ve picked out your dream car, the first service is on us. Our remarkable customer service doesn’t end with your vehicle purchase, so take advantage of what we have to offer by making your way to our location today! You can find Certified Headquarters at 873 Middle County Road in St. James. You can also reach Certified Headquarters by phone by calling 631-366-3700 to learn more about the vehicles we have available on our lot. We hope you will make your way to our dealership soon and we look forward to working with you!